…the engine feels stronger than 500 horsepower, more like 550. A Lexus spokesman provides a torque figure: 369 pound-feet. We are taken by the quickness of the throttle’s response, especially when the engine is revved past 4200 rpm. Max engine speed is nearly 9000 rpm. The exhilarating responsiveness feels similar to the Porsche GT3’s 3.8-liter flat-six and even reminds us of the Ferrari Enzo. A blast from standstill, with a glance at a stopwatch, suggests a 0-to-60-mph time of about 3.5 seconds, putting the LF-A comfortably into supercar territory. When the LF-A hits public roads next year, it will be equipped with ceramic brakes with six-piston calipers in front and four-piston units in the rear. The LF-A picks up speed amazingly fast, as if shot from a sling. A nonvariable rack-and-pinion steering system results in precise turn-in, and if any body roll exists, we didn’t detect it. 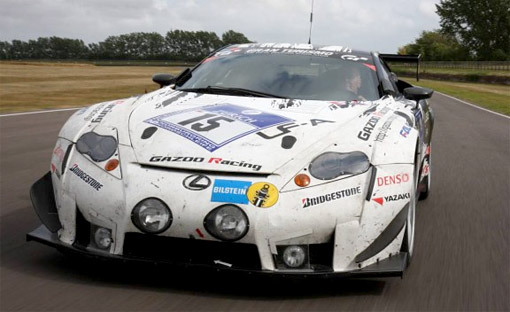 Did Car & Driver just compare a Lexus to the Porsche GT3 & Ferrari Enzo? If I had any doubts at just how fantastic the LF-A was going to be, this article would have erased them.